Liquid Proust Teas has provided me with Elixir #9 for the purposes of providing an honest review. There are some teas that just make me go ‘awe’ at how pretty they are, and Elixir #9 is one of those teas. It’s definitely the peach blossoms that do it for me, because I’ve never seen peach blossoms in a tea before so I’m curious about how it’ll look when steeped. All of the oolong is rolled up into tight little balls, so I’m curious about how big the leaves actually are, given that they’ll unfurl when steeping. Elixir #9 is made out of green oolong (Vietnamese tung-ting), peach blossoms, and flavouring. After opening the bag, the first thing I smell is the beautiful smell of the tea leaves. Along with the smell of tea, it smells a bit sweet in a floral way but it also reminds me of longan at the same time. Given that the tea looks amazing, I looking forward to giving it a try. 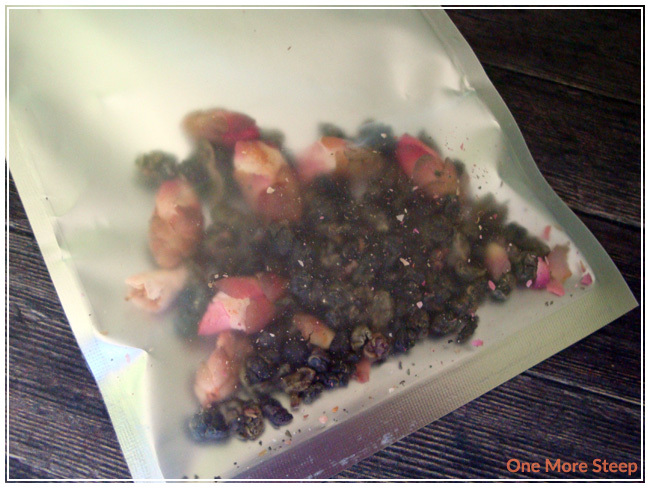 Liquid Proust Teas recommends steeping Elixir #9 in 185°F (85°C) water for 3 minutes, I steeped for about 3 minutes. The oolong unfurls beautifully when steeping, the peach blossoms darken a bit in the hot water but otherwise don’t seem to change. The tea is gorgeous though, it smells amazing when it’s steeping. Elixir #9 has a delicate floral scent to it, which is enticing, and it steeps to a beautiful yellow colour. The taste of Elixir #9 is, in short, amazing. The taste of the tea is smooth, not bitter at all, with a light floral flavour that matches the scent. It’s almost a little bit sweet, which makes Elixir #9 quite enjoyable. 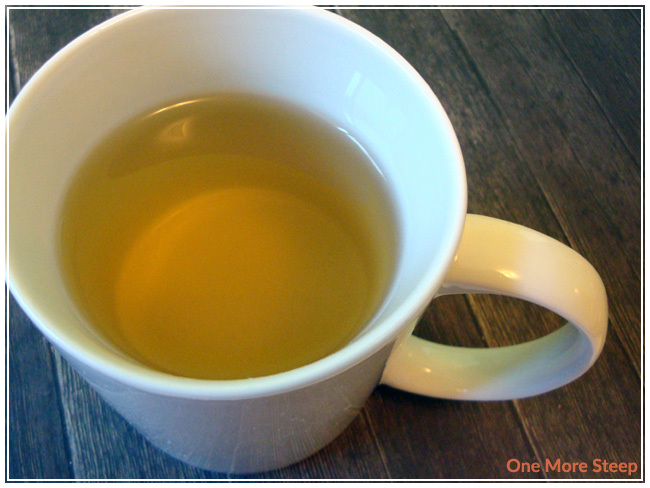 The smooth texture of the tea makes it an easy drink. 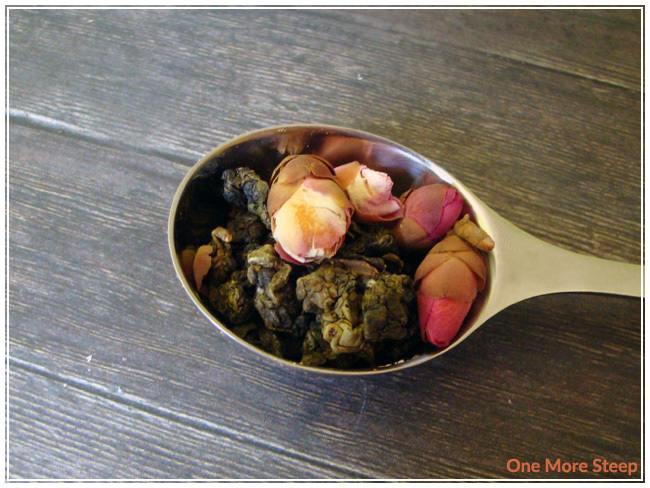 The peach blossoms add the floral flavour that gives the tea an extra little something. I really wanted to try resteeping the tea, so I did! It tastes just the same for the second and third steeps without any noticeable change in the flavour. I loved Liquid Proust Teas’ Elixir #9. It has a beautiful aroma, delicate and delicious flavour, and is a pretty tea. Elixir #9 is an amazing tea, and great value in the fact that it can be steeped multiple times without any less flavour. The smooth taste and floral-mixed-with-tea flavour is amazing – plus that wonderful yellow colour is a delight in a cup!